The waste solvent collection system and transfer system that eliminates the need to use a funnel and hood for the bulking of waste solvents. We have removed the need for respirators and have addressed the ergonomic problem of lifting and pouring a fifty-pound container at shoulder height. Breaks the ergonomic barrier by eliminating heavy lifting  by your staff. 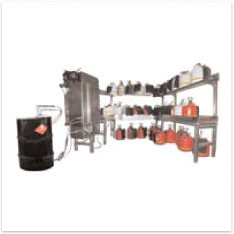 Eliminates the use of a funnel and hood for the bulking  of waste solvents. Removed the need for respirators. The Xtractor transfer system is designed to eliminate the problems inherent with the use of a funnel and a drum for the bulking of waste solvent and chemicals collected from laboratories. Using the Xtractor eliminates the need to pour a 50-pound container at shoulder height. Operators are no longer exposed to the chemical spills that occur when the funnel burps. We reduce the need for extensive personal protective equipment and forced air breathing apparatus or respirators. Overfill spills are eliminated. The whole system is air operated so the risk of explosion or fire is minimized. All components that are in contact with the solvents and chemicals are either stainless steel or PTFE (Teflon). Looking for the perfect waste solvent transfer system? Let Waste Control Systems custom tailor the Xtractor to fill your needs.